Catalog Home > ACTÍVA Products, Inc. > PermaStone™, 28 oz. PermaStone is the ideal casting compound when permanent, break-resistant castings are desired. It handles like plaster and has a stone-like finish. Even if it happens to break, the fracture is clean and easily glued/fixed. It can be painted as it dries white with acrylics, oils, watercolors, tempera or any other finish! 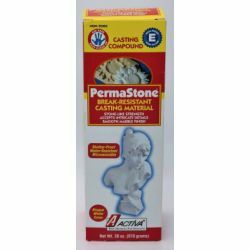 PermaStone mixes easily with water, is microwavable, non-toxic, and water resistant.